LONDON (Reuters) - Fifteen year-old Ma'edeh Shabaninejad was arrested two months ago at her aunt's house in the southern city of Ahvaz, where she was hiding after security forces raided her own home and confiscated her poems, her father said. Sahid Shabaninejad said his daughter had told her mother in weekly calls she is allowed from jail that she had been accused of inciting violence through her poetry about Iran's Arab minority. "Resist, my homeland, there is not much left of you," one of her verses said. "Soon you will hear in your sky the sound of smiles and liberation's call." The community is also caught in a struggle between Iran's Shi'ite rulers and Sunni-ruled Saudi Arabia that has fuelled civil wars in Syria and Yemen and spread fear of wider instability. "I am amazed the Iranian government is afraid of a 15-year-old girl," Shabaninejad said by telephone. "A young girl is in constant fear in prison and cannot sleep at night." Another relative said Ma'edeh's aunt was detained the same night and some cousins were arrested the following day. Reuters was unable to confirm their accounts with the authorities, who do not usually release the names of detainees. "Islamic values and the country’s constitution oblige all bodies of the Islamic Republic to prevent any discrimination and inequality towards Iranians of any ethnicity, race or religion," he said in a statement on his website last July. Ahvaz is the regional capital of the ethnically diverse southwestern Khuzestan province, home to most of Iran's Arabs. Sporadic demonstrations continued there after they died away elsewhere, with local Arabs voicing anger against what they say are barriers to fair employment and political rights in a region which accounts for 85 percent of Iran's oil wealth. The Iranian government says it recognises drought is a major problem and is doing what it can. 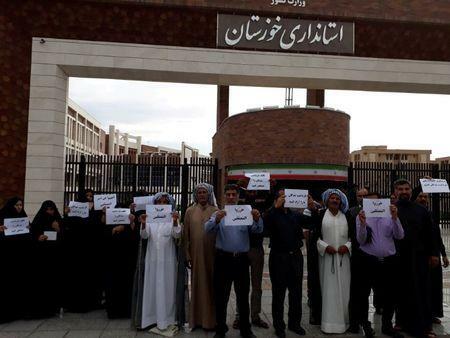 In 2016, it acknowledged discrimination in employment in Khuzestan, saying it resulted from the province's internal affairs, not government policy. Several released prisoners and detainees' relatives told Reuters they had come under pressure from security forces, especially the Revolutionary Guards, not to publicise their detention. At a demonstration in Ahvaz in February, participants drew parallels between water and electricity shortages in the town and in Syria's Aleppo, where Iran is building power plants after helping the government to oust rebels at the end of 2016. "Ahvaz is like Aleppo, it has no electricity, no water," video footage on social media showed Iranian Arab protesters chanting at the rally, before police broke it up. Official figures show joblessness in Khuzestan fell in recent years, but at 14.5 percent it is above Iran's 11.8 percent. Ahvazi activists said they had found few Arab managers in government and local industries in a recent survey and accuse the authorities of trying to change the area's demography. Iranian officials have confirmed that migration from other provinces has affected the region's demography, but say that is not the result of government policy. In March, thousands of Arabs in Ahvaz and other cities in Khuzestan took to the streets for several days to protest against a children's television show about ethnic diversity. Khadijeh, 36, was arrested with her niece Ayasheh, 19 in a taxi they took after attending a protest outside the state broadcaster's building in Ahvaz, family members said. "Khadijeh is not a political activist, she is a mother of three children. She attended the protests only to defend their basic rights," her sister Haifa Sadam said in an interview with Reuters from Copenhagen. Three activists said some of the arrests were linked to growing numbers of Iranian Arabs switching from Shi'ite Islam, Iran's official religion, to Sunni Islam, practiced in Saudi Arabia and the majority creed in the Arab world. Iran says reports of mistreatment of Arabs are propaganda fanned by Gulf countries to stir unrest. In March, Tehran said police had seized what it described as a Saudi and Western-backed "terrorist cell" in Khuzestan with grenades and anti-tank weapons. A member of the Assembly of Experts, the clerical body that appoints Iran's supreme leader, last month acknowledged environmental problems, unemployment and poverty in Khuzestan while urging Arabs to express grievances through legal channels. "The enemies of the unity of the Iranian nation and their domestic agents are trying to fish in troubled waters, and to derail the legitimate demands of Khuzestan's people by provoking ethnic and tribal sentiments and prejudice," Mohammad Hossein Ahmadi-Shahroudi said in a statement on ISNA news agency.